Lapopu Waterfall is a natural phenomenon formed by the fault movement in the river flow so that the river flow forming steep cliffs. Lapopu Waterfall flow along the rock cliffs as high as 70 meters. 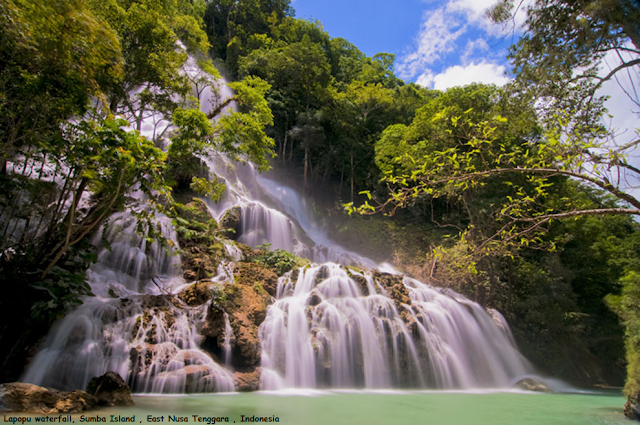 Located in Sumba Island, Manupeu Tanah Daru National Park consists plenty of steepy slopes. The slopes rise from the sea reaching height of 600 meters. The park is a habitat of 87 species of birds, all are protected. 7 out of them are endemic to the island including Cacatua sulphurea citrinocristata, Rhyticeros everetti, Treron teysmannii, Ficedula harterti, Coracina dohertyi, Nectarinia buettikofer. The first two birds are rare and almost extinct. The park is also home for 57 butterfly species, 7 of them are endemic to the island; Papilio neumoegenii, Ideopsis oberthurii, Delias fasciata, Junonia adulatrix, Athyma karita, Sumalia chilo, dan Elimnia amoena.